According to the Sindo today, the people of the south are poised to waste several million euro on something that could have been done without. Going by the opinion poll figures they cite, President Michael D Higgins has some 67% of the electorate behind him as he looks to make his 7-year stint in office a total of 14 years. Next on the popularity poll is Sean Gallagher, who gets 15% support, with his fellow-judge on Dragon’s Den Gavin Duffy getting 6% support, Senator Joan Freeman 3%, and the Sinn Féin candidate (about to be announced if not already announced) getting 7% support. I think we’d be well to treat these figures with caution. For a start, the campaign hasn’t yet begun, and we don’t know who will be the Sinn Féin candidate – although we can guess it’s going to be Liadh Ní Riada. Think Trump. Think Brexit. Think the last presidential election, when it was pretty well in the bag for Sean Gallagher (yes, Virginia, the same man) until some uncomfortable matters emerged in the final TV debate. Of all the candidates, the one who seems least likely to succeed is Sean Gallagher. His claim to fame and to be a worthy occupant of Aras An Uachtarain is that he was a judge on Dragon’s Den – a bit like Donald Trump then, except not so wealthy and better hair. But you’ll remember Gallagher was sunk at the final TV debate because Martin McGuinness raised the question of Gallagher receiving money for getting people’s photograph taken with Brian Cowen. 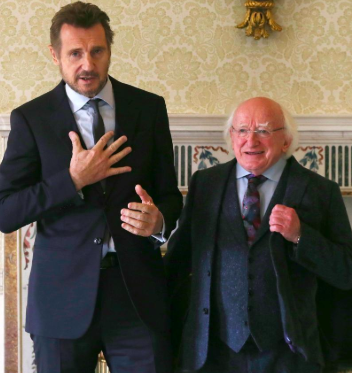 Exit Sean Gallagher stage left in some confusion, enter Michael D Higgins as the new President. Presumably the 15% who support Gallagher are now willing to forgive and forget, just as the electorate have forgotten and forgiven Fianna Fail for their part in the financial debacle of 2008 and after. Will this matter be raised in the election? I should think so. But none of that will matter if Michael D’s 67% is translated into votes on election day. The main reservation I’d have is that Michael D, when campaigning last time out, made it very clear that he would be a one-term president. Now that he’s come to the end of that one term, he says he wants to be a two-term president. There’s a word for that and I’m not sure ‘changing your mind’ is the phrase I’d reach for. My gut feeling is that Michael D may weather the storm of an election which will be bare-knuckle, if the last one was anything to go by. But I also suspect the comparative youth of his opponents may make him look like a national treasure that might be better on a pedestal than zipping around the campaign trail. A lot will depend on those famous TV debates, assuming they’ll happen. And assuming that Miriam O’Callaghan doesn’t ask Michael D when he was last at confession. That’d be a particularly unfair question, given that Michael D is an atheist. Stop picking on Karen Bradley!